Sylvia returns to the elf forest very much secure in her personality. Her two friends have survived the trip around the world as well. Also, her paramour, who has accepted the past of the lady and is willing to continue to be a presence in her life. While Sylvia understands the evil that changed her life is still a threat, she hopes to spend her time preparing for the challenge by securing her identity. There are however those that know who Sylvia really is, and do not want her alive. She and her friends must balance their hopes for a pleasant future with the knowledge that their very lives could come to an end. Wanting to finish the story of the early events of Sylvia and her friends, I started this tale. By now I was quite comfortable in the quality of my early notes, so wrote this rather confident that it would follow the story. It did. This novel was not published. It would have been. I had actually gone out and had some successful conventions selling my earlier books. I lost my job however, so my source of finances in making the conventions dried up. Not having an outlet to see my books, I did not seek finishing the trilogy. Those who claimed to have read the first two books would however be sent this manuscript. It was also posted to the internet. Note that it is also presently in need of rewriting into a more acceptable PoV. I finished the rewrite of this one and have sent it to my reader. Really have my hopes up of finding a place for them. When I went out selling books long ago, I did not have the trilogy finished. By the time I had it finished, I did not have a job to support my going out and selling books. The next time I go out, I can have a complete set. All three books are now available. All three have been edited. Yes, the covers show my sense of color and artistry, but I am not selling the covers (you might or might not buy it due to the cover, but it was the story where I put my focus). 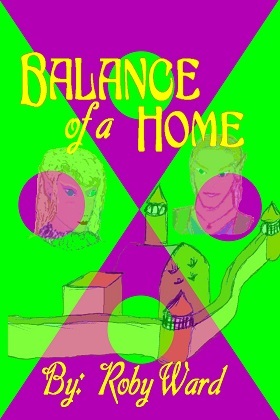 Anyway, "Balance of a Home" is now available on Kindle and Nook. Remember the name of the author is Roby Ward.